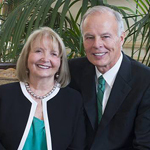 The Temple Square mission will have a new mission President in Jan. The sisters will miss the Gillettes terribly. Change is good. These Visitor Center Directors come with so much experience. David Edward Poulsen, 68, and Adrienne Veneta Wilson Poulsen, six children, East Millcreek 12th Ward, Salt Lake East Millcreek North Stake. Brother Poulsen served as president of the South Africa Johannesburg Mission and is a former stake patriarch, counselor in a stake presidency, high councilor, bishop, gospel doctrine teacher and missionary in the Southern Far East Mission. Former president and chief executive officer for American Express Centurion Bank. Born in Provo, Utah, to Charles Edward and Annie Leona Clegg Poulsen. Sister Poulsen served with her husband in the South Africa Johannesburg Mission and is a former ward Relief Society president, ward Young Women president, ward Primary teacher, ward missionary and gospel doctrine teacher. Born in Los Angeles, Calif., to Charles Kimball and Veneta Caroline Wilson.